UPDATE: I stand corrected by a Bapa. 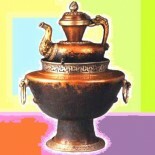 “Terro” is actually “Tinru” [སྤྲིན་རུབ།]. This type of momo is also commonly refered to as “Thundril” Momo [མཐུན་སྒྲིལ་མོག་མོག་] which means “Unity” Momo. This is one dish that I’ve heard about and been intrigued by, but had no idea how it was made. I’ve had many a conversation about this strange giant Momo that takes up a whole steamer, and is filled with meat and potatoes. I couldn’t quite figure it out and it’s remained on my “find out” list for a long time – especially since my husband talks about it so fondly. He had eaten it when he was very little and remembers that it was a huge Momo and that it was quite delicious. He thought it was a dish from Amdo. But my Amdowa friends told me, that there is nothing like that in Amdo. Then one of my Khampa friends told me – “Oh! It must be the Bathang momo you’re talking about. It’s delicious.” But he didn’t know how to make it. Then another friend said, “I remember we had a Khampa Rinpoche in our home once and he made this for us. He put meat, potatoes, and spices and wrapped the whole thing in dough and steamed it in a big steamer.” That sounds simple enough but doesn’t quite explain how it’s made. I was determined to keep asking around to figure out how to make this dish and it was to my utter delight, that a video of the making of this dish was posted on Lhakar Diaries by Pema Yoko. That’s when I learnt that it is called “Terro.” And the following weekend, I followed the cooking technique on the video and made it for our dinner. It turned out really quite delicious and was quick & very easy to make, but next time round, I will add more meat and less potatoes!! I share my recipe here. I have to say this post makes me very happy. One of the main reasons for my starting this blog is that we have so many things in our culture that are under threat – that would disappear if we don’t make the effort to save them. So, while food and recipes are quite mundane, it gives me great pleasure to think that some young Tibetan somewhere might read this blog and be inspired to make a delicious “Terro” – and be able to rightfully bask in the taste and smell of the food of his ancestors. Special thank you to Lhakar Diaries from Simply Tibetan. Prepare the dough. Put the flour in a large dish and gradually add the water, mixing the flour and the water till it the dough is formed. Knead it well until the dough is a smooth texture, cover and let stand while you prepare the rest of the ingredients. Beef – Cut it up into relatively small bite size pieces. (I used Beef Chuck Roast, which is a relatively economical cut of beef but it has a good balance of meat and fat.) 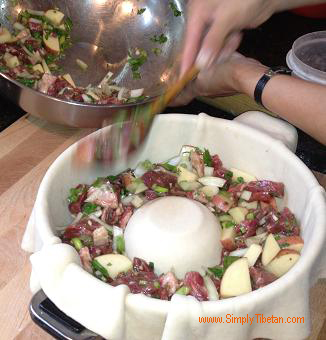 Chop the potatoes, and the rest of the ingredients – celery, spinach, spring onion, onion, garlic, ginger. Put all the ingredients in a large bowl, add the spices, and mix it together nicely. Now its time for the rolling pin. 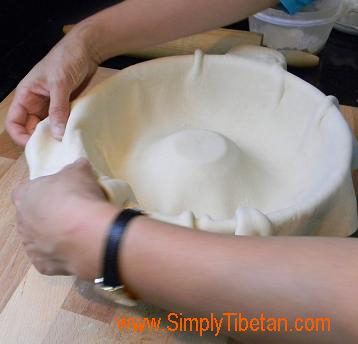 Spread the dough out large and round – till its slightly bigger than your steamer. It should be thin enough to hold the stuffing but not too thin. Sprinkle a little flour over the dough if it starts sticking. Oil your steamer, so that the dough does not stick. Place a small bowl upside down in the middle of your steamer, and place the flattened dough skin over the whole steamer. If its too big, you can tear off the extra dough around the side. 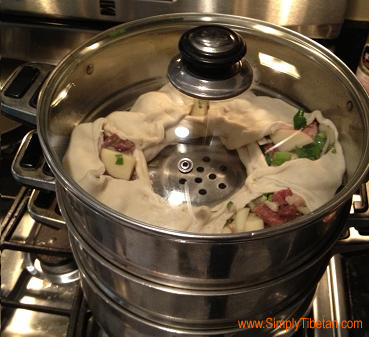 Add the meat filling into the dough lining on the steamer – do not press down, let it take its own form. 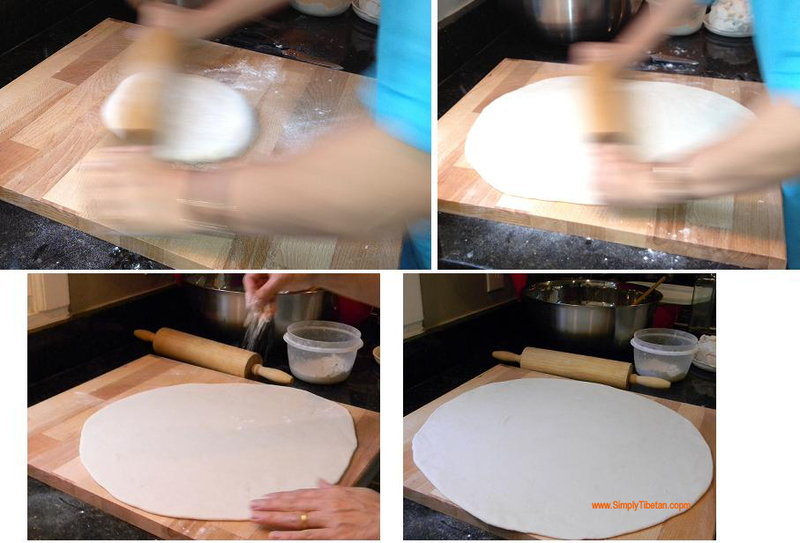 Once you’ve added the meat filling, tear a hole in the dough lining in the center, over the upside down bowl, and pull over the dough from the side and pinch it together. Repeat along the whole edge. Remove the cup, and its ready to steam. Add plain water to your steamer bottom and once the water is boiling, stack the steamer on top, and just let steam until done. It should take about 25-30 minutes. When I was a kid, my late father (Bapa) used to make “Tinru.” I tried making it many times, but the dough tears every time I stretch it to add the fillings. Even though, it didn’t look as beautiful as my father would wanted, it was yummy!!! Very similar to the giant momo my Lama friend would put in a pan with a bit of oil and fry the momo at low flame, covered, so it would get crispy on the bottom and steamed on the top. I’ll have to try this recipe as it looks great. wow.. its really nice. for the first time i have seen such momo. wow ……i heard this name when i was in tibet . but i never have had it , thanks for the recipe and i will try it myself later. Thanks for the recipe. Will definitely give this a go, looks relatively simple to make. One can also add some Fing and Mongro in the the mixture. Thank you! i m sure going to try this one… its less time consuming ( well less work:) ) and seems delicious!! This is what my mother used to make us when we were younger. At first I thought she made momo the fast and ugly way but she later said my grandfather made this often when they were young. So cool that the recipe’s up now. Thanks! 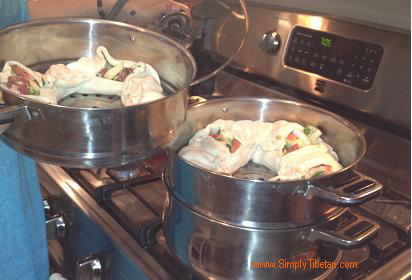 This entry was posted on September 22, 2012 by simplytibetan in Recipes and tagged Baba momo, baba terro, Bathang momo, momo, Simply Tibetan, Terro, tibet, tibetan cooking, tibetan food.